It’s a jaded Art Historian who turns the traditional idea of the “June Bride” sideways. Here are works of art that sort of give a different perspective on the whole subject of weddings. Although Nevelson originally considered herself a painter, she turned to sculpture while teaching in the WPA from 1935 to 1939. This came after she had seen African and other non-Western sculpture on a visit to Paris in 1926. Her early sculptures were Cubist in conception, but during World War II (1939–1945) she came under the influence of Surrealism. 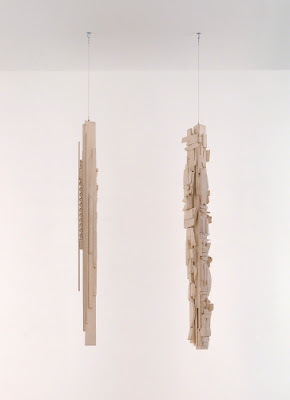 It was at this time that she began collecting wood fragments and objects from the streets of New York. In 1943, she created the first complete room environment in the history of American art. It consisted of constructed and found objects. 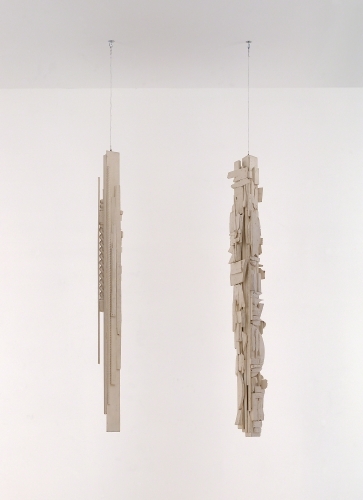 This established her as a pioneer of American abstract sculpture. Bloom’s family emigrated from Latvia to New York in 1920. As a teacher in the WPA from 1935 to 1940, he taught students to rely on memories to help them create expressive compositions. 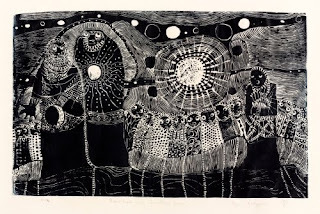 Many of his works are the result of his memories of his childhood in Latvia, Jewish folklore, and even the occult. His style has variously been called Boston Expressionism and Abstract Expressionism, because he exhibited with Willem de Kooning, Jackson Pollock, and Arshile Gorky. However, his works of the early 1940s show an abstract potential that would make him one of the earliest Abstract Expressionists. Bloom achieved fame when he took part in the groundbreaking modernist exhibition Americans 1942: 18 Artists from 9 States, from which show MOMA bought The Bride. The Bride is an example of his interweaving of dream and spiritual imagery into a narrative composition. The somewhat eerie figure of the bride is overwhelmed by feelings, hopes, and dreams in the form of symbolic objects such as flowers that completely enfold her. Goldin left home at the age of thirteen, and took up photography at the age of fifteen, eventually studying at the School of the Museum of Fine Arts in Boston. Alienated from her family, she hung out with other disaffected young people on Boston’s streets and documented the rough, often violent relationships, both friendships and romantic, from the late 1970s through the 1980s. Her work evolved out of the Snapshot Aesthetic, a style that mimics the casual, amateur photos taken by people in public and private moments. Snapshots, taken out of love to recall people, places, and good times are also about creating a recorded personal history. Because of her many bad experiences in relationships, Goldin has a certain mistrust of the image projected of love, marriage, and family by American TV shows of the 1950s. 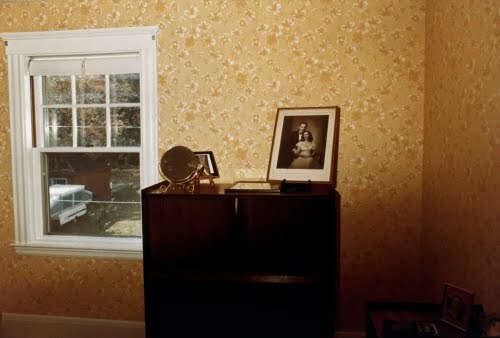 This stark, isolated view of a wedding photo in an empty bedroom has a certain air of melancholy, although it is documenting a commonly cherished goal of many people. I’ve always considered quilts to be of the fiber arts medium. They were traditionally considered “woman’s work” until the Feminist Art Movement of the 1970s effectively pointed out the contribution women have made to the arts of all media throughout history, quilting being one of them. The Wedding Ring and Double Wedding Ring quilt patterns have traditionally been made as wedding presents. The pattern of interlocking rings may be as old as the 1400s or 1500s in Europe, but was first published as a quilt pattern in the US in 1928. The pattern had previously appeared on ceramics and coverlets of Pennsylvania German settlers as early as the 1600s. 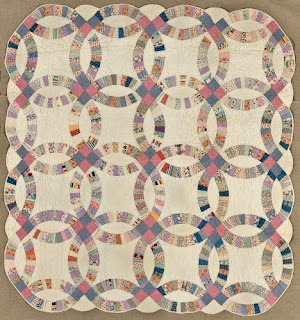 The history of many quilt patterns is usually obscure because they are created under a variety of different names such as Pincushion, Endless Chain and Friendship Knot. Of the many legends about Double Wedding Ring origin, the typical “romantic” version ascribes the pattern to couples who were too poor to afford wedding rings, and a good-hearted female relative supplied them with a quilt such as this so they would have them. Rakgoathe’s education as an artist in South Africa under Apartheid is a singularly inspiring example of an artist persisting in his effort to produce not only his own work, but encourage students he taught to become artists. He was a philosophical loner, with an interest in spirituality and mysticism. This is clearly visible in his prints, especially those produced between 1968 and 1976, when he taught art at the Jubliee Art Center in Johannesberg and the Mofolo Arts Center. Like many of the artists who worked at the Rorke’s Drift art colony, Rakgoathe preferred the linoleum cut medium. He effectively translated the stylized figure style of African sculpture into these mystic subjects. The idea of a Moon Bride and Sun Bridegroom is a Judeo-Christian concept based on the archaic, misogynistic idea that the bride, like the moon does not give off its own light but reflects that of her husband, the sun. Yech. This is probably not the type of garment one would see on Say Yes to the Dress, but I think it’s a lot more interesting. It’s worn with a voluminous, high-waist dress. The volume of the dress helps the bride catch dates and chestnuts thrown to her by her in-laws, symbols of future offspring in her marriage. That’s in the second part of the traditional wedding ceremony at the groom’s parents’ house. I never thought I’d believe something I saw on the TV show MASH, but I guess the first part of the traditional ceremony is simply the bride and groom drinking wine from a shared gourd. I guess the gourd is grown by the bride’s mother? 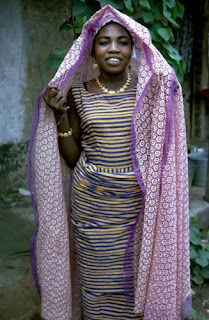 The Ewe, Fante, and Asante cultures of Ghana all claim the origin of kente. Among the Asante, the women traditionally process the cotton and the men weave the cloth. 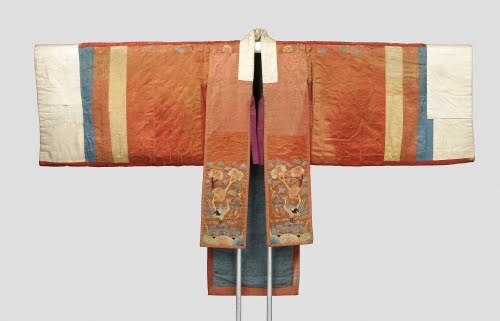 The cloth is woven in 4" (10.2 cm) wide strips that are subsequently sewn together to form bolts of cloth. The loom used is a traditional wooden backstrap loom. Originally made from white cotton with some indigo patterning, kente cloth evolved when silk arrived with Portuguese traders in the 1600s. Fabric samples were pulled apart for the silken thread, which was then woven into the kente cloth. 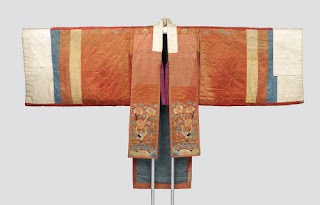 Later, when skeins of silk became available, more sophisticated patterns were created—although the obscenely high cost of the imported silk meant they were only available to Asante royalty. In the 1960s, the Kente Weavers of Ghana, led by the Adanwomase Weavers Association, honored the first President of Ghana, Dr. Kwame Nkrumah (1960–1966) with a Kente cloth by name, Fatia Fata Nkrumah, in a colorful ceremony. This pattern has an especially complex pattern to weave. The colors in kente cloth are symbolic. Blue and purple symbolize, appropriately for a bride, peacefulness, harmony, good fortune, and love. Now these wedding dresses start to approach the big glamour of Say Yes to the Dress! I think the bustle looks a lot more appropriate on a wedding dress than it would on something to wear to work. 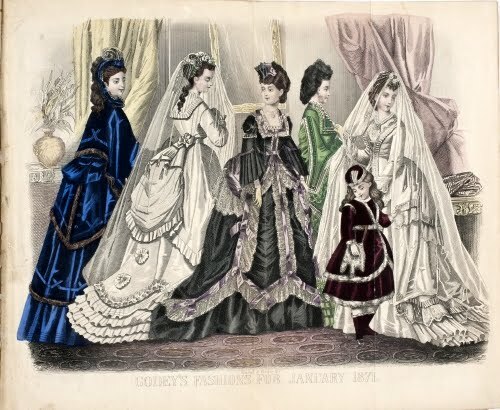 In 1871, the hoop skirt (crinoline) of the 1860s had evolved into the sort of half-hoop skirt with a (collapsible) wire cage only in back—the bustle! It’s still a lot of material. I don’t think this fashion was meant for women in practical everyday lives, but I sure do love to see a room full of Miss Kitty’s from Gunsmoke!